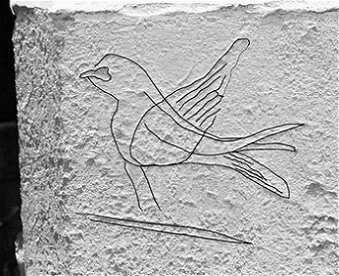 In the November 2011 Beacon, I reported on the recording of the medieval graffiti in St. Lawrence’s church by Richard Neville. 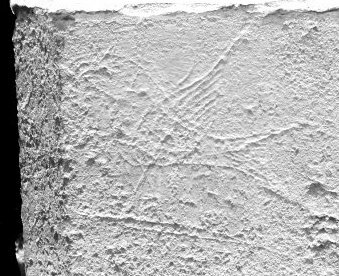 He has sent me some very interesting photographs of some of the graffiti he has discovered, all of which we had no idea were there. There appears to be a horse to the right of the main door with part of its rider blotted out. When we first saw this one we couldn’t work out what it was, and no wonder, for it wasn’t until Richard manipulated the image on his computer screen that he discovered that it was upside down. This suggests that the doorway has been rebuilt using the same stone blocks but putting them in different places. On the left of the main door is a circle. Richard said that circle graffiti made with dividers are very common, but ours is an unusual example. Also on the left is, perhaps, my favourite etching. It is of a bird which resembles a swallow. It is very hard to see from the original photo but by the magic of computers Richard has outlined it so we can see it easily (Hover your mouse over the picture). Near the lectern is a figure of what looks like a lady with very thin arms, on the right side of the main door on the outside there are possible sun- like images, the likes of which Richard has never seen anywhere else and on the column is another unusual etching which looks like a dandelion seedhead and leaves, the dandelion being a symbol of Christ’s Passion. There are more graffiti in the church but Richard says these are the best ones. We are very grateful to him for revealing these treasures for us.